Generally in a production setup, there is a need to enable monitoring mechanisms within an Apigee Edge for Private Cloud deployment. These monitoring techniques warn the network administrators (or operators) of an error or a failure. Every error generated is reported as an alert in Apigee Edge. For more information on alerts, see Monitoring Best Practices. Apigee-specific Java Server Services – These include Management Server, Message Processor, Qpid Server, and Postgres Server. Third-party Services – These include Nginx Router, Apache Cassandra, Apache ZooKeeper, OpenLDAP, PostgresSQL database, and Qpid. 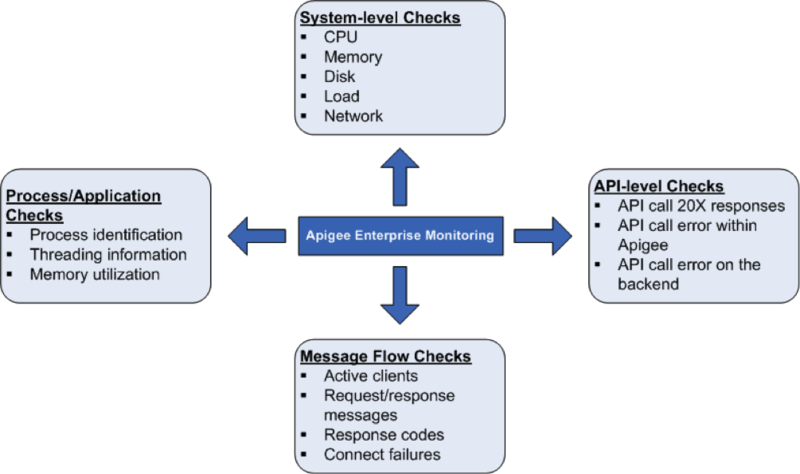 In general, after Apigee Edge has been installed, you can perform the following monitoring tasks to track the performance of an Apigee Edge for Private Cloud installation. It is very important to measure the system health parameters such as CPU utilization, memory utilization and port connectivity at a higher level. You can monitor the following parameters to get the basics of system health. CPU Utilization – Specifies the basic statistics (User/System/IO Wait/Idle) about the CPU utilization. For example, total CPU used by the system. Free/Used Memory – Specifies the system memory utilization as bytes. For example, physical memory used by the system. Disk Space Usage – Specifies the file system information based on the current disk usage. For example, hard disk space used by the system. Load Average – Specifies the number of processes waiting to run. Network Statistics – Network packets and/or bytes transmitted and received, along with the transmission errors about a specified component. Process identification: Identify a particular Apigee process. For example, you can monitor for the existence of an Apigee server java process. Thread statistics: View the underlying threading patterns that a process uses. For example, you can monitor peak thread count, thread count for all the processes. Memory utilization: View the memory usage for all the Apigee processes. For example, you can monitor the parameters like heap memory usage, non-heap memory usage used by a process. This call returns the "true" and "false". For best results, you can also issue API calls directly on the backend (with which Apigee software interacts) in order to quickly determine whether an error exists within the Apigee software environment or on the backend. Note: To monitor your API proxies, you can also use Apigee's API Health. API Health makes scheduled calls to your API proxies and notifies you when they fail and how. When calls succeed, API Health shows you response times and can even notify you when response latency is high. API Health can make calls from different locations around the world to compare API behavior between regions. The Router implements a health check mechanism to determine which of the Message Processors are working as expected. If a Message Processor is detected as down or slow, the Router can automatically take the Message Processor out of rotation. If that happens, the Router writes a "Mark Down" messages to the Router log file at /opt/apigee/var/log/edge-router/logs/system.log. where /<MP_IP>:<PORT> is the IP address and port number of the Message Processor.